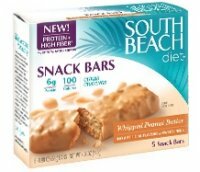 South Beach Diet Bars are a convenient way to eat well-timed snacks and help you push hunger away and feel energized and satisfied when you're on the go. They come in four tasty varieties — Meal Bars, 100-Calorie Snack Bars, Protein Fit Cereal Bars and Fiber Granola Bars — in delicious flavors like peanut butter and chocolate. And there are no artificial flavors, sweeteners or sugar alcohols.